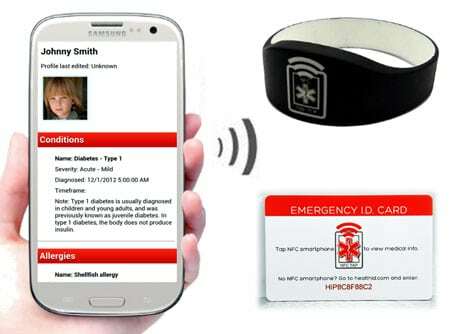 HealthID Profile, a health management solutions provider, has introduced wristbands and cards that store important personal health details and can be accessed by an NFC phone in a medical emergency. The products, which can be used to bring critical health information to the attention of clinicians at the point of treatment, are currently available for pre-order and are due to ship to customers next month. To use the wristband or card, a customer needs to complete a three-step online registration process where they enter the details they wish to store, along with the wristband or card’s unique HealthID code. This information is then stored in the cloud. When tapping the wristband or card with an NFC device, the customer’s stored medical information is pulled down from the cloud and appears on the screen of the device being used. “We looked into a few different technologies,” co-founder and CEO Angelo Pitassi Jr told NFC World. “We decided on using NFC back in September last year, a premature time for NFC, but this technology made the most sense to us for numerous reasons. “It doesn’t require any special app to be downloaded, like you would need for QR codes for example; you just need an NFC device to tap against the band or card and the critical information is available in seconds. Users are given log-in details so that they can visit the company’s website and change the information that is associated with their card or wristband whenever they need to. “We are right now completing a mobile app that will be free to download, which will make it easier for a customer to manage their account right from their mobile phone,” Pitassi added.